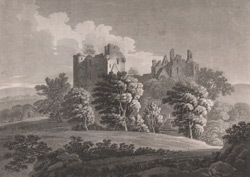 View of what is thought to be Doune Castle by Hugh William Williams (1773-1829). Doune castle takes its name from ‘dun’, meaning fortified town. The L shaped tower house was built in the 14th century by Robert Stewart, Duke of Albany. It was strategically situated by the River Teith and protected a route from Edinburgh to the north. Hugh William Williams, sometimes known as ‘Grecian Williams’, was the orphaned son of a sea captain, who studied art in Edinburgh under D. Allen. He toured the British Isles drawing and painting and became a talented landscape artist known for his paintings of the Scottish Highlands.